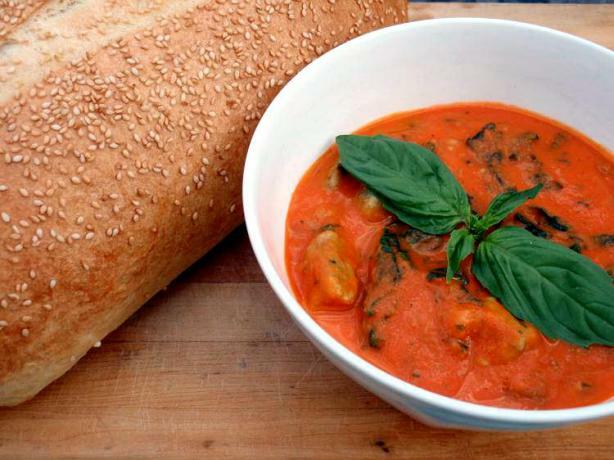 Enjoy an easy delicious soup or sauce. 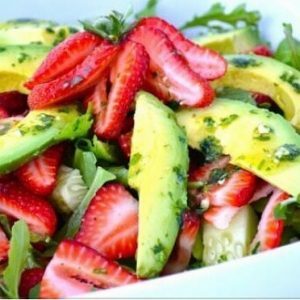 Strawberry Avocado Salad. Perfect meal for the summer when everything is fresh in season. You will need 1 ripe avocado, 1 cup of sliced strawberries, 1 cucumber and your favorite greens. Add my Lemon Basil Dressing or your favorite dressing. Stay away from the bottled dressings with additives and chemicals. Lemon Basil Dressing: I use a food processor. 1 to 2 cloves of peeled garlic, 1 handful of fresh basil, 1 whole lemon juiced and 1/4 cup of olive oil. Blend all ingredients together and add to your salad or use as a marinade. Tomato soup is a familiar and beloved comfort food. In this version, roasting the tomatoes in the oven (or using canned roasted tomatoes) can lessen their acidity and add natural sweetness. The tomatoes blend beautifully and colorfully with the carrots in this recipe, rich in vitamin A and beta-carotene. Drizzling a little bit of pesto in the bowl takes this recipe over the top. Yum! Variation: You could add leftover grilled shrimp, chicken or a variety of different vegetables. Preheat oven to 400 degrees. Gently squeeze the tomatoes by hand to remove excess seeds, then put them in a bowl and toss with 1 TBL grapeseed oil and 1/2 tsp sea salt until evenly coated. Place the tomatoes, cut side down, in a single layer on sheet pans and roast for 20-30 minutes, until their skins are just browning and the juices are bubbly. Let cool for five minutes, then lift off the skin with a fork. Skip these steps if you want to instead use two 28-ouunce cans of roasted tomatoes. Meanwhile, heat the remaining one TBL grapeseed oil in a soup pot over medium heat, then add the onion and a pinch of salt and saute until golden, about four minutes. Add the carrots, garlic and 1/4 tsp salt and continue to saute until the carrots are tender, about five minutes. In a blender, puree the tomatoes with their juice and the carrot mixture until smooth. Add broth as needed. Taste and add additional salt if needed. Divide into bowls, drizzle pesto over and enjoy! This recipe calls for Miso. Some of you may never have hear of it so I will tell you all little about it first. You can find it in a health food store (Whole Foods, Natures Way, etc) It comes in a bag. Brown or amber fermented flavoring paste made from soy or other beans, grains, and sea salt. Buy unpasteurized (for live enzymes to aid digestion). Add to soups, stew, sauces, or dressings. It renews intestinal flora, alkalanizes the blood, helps cleanse nicotine and radioactive substances from the body. Vegetable soups can be made with 2-3 vegetables, water, stock, and a dash of tamari, miso, or herbs. The secret? Boil the water or stock first, to keep the vegetables from getting soggy. Add the harder vegetables (roots, winter squash, stems) and cook until almost soft. Then add the light ones (greens, celery, cauliflower, broccoli tops). Simmer until just crunchy or tender. If you cook the vegetables too long where they become mushy, you are also cooking out some of the nutrients. Flavor to taste, and garnish with parsley or green onion, chopped basil, etc. I love to add chopped tomatoes to my vegetable soup. If you have a tiny piece of leftover London broil or steak or chicken or turkey, chop it up and add it to your soup. Bring water or soup sock to a boil and add diced broccoli stems and onion. Cover and simmer 10 minutes. Put 2 cups of the soup liquid in the blender with rice or oatmeal. Blend until smooth, then return to the pot. Add broccoli tops and simmer until they’re tender. Flavor with miso to taste.